There are mainly two reasons why people give their dog joint supplement. Usually it is because the dog already has joint problems, e.g. dog arthritis or canine hip dysplasia. However, dog owners are increasingly using joint supplements for dogs to try to prevent or delay joint problems in the future. Dog joint problems can affect all breeds and ages. Some breeds are though more likely to develop joint issues than others, e.g. many of the larger breeds. Joint problems are also more common (and severe) as the dog gets older. Both genetic and environmental factors can cause joint problems in dogs. For example, dog can be born with canine hip dysplasia (early onset hip dysplasia), develop it later in life (later onset hip dysplasia) or the dysplasia can be caused by environmental factors like rapid weight gain, pelvic injuries, poor nutrition, etc. Early detection of joint problems is important, as it is easier to deal with all joint problems in the early stages. Dogs' pain threshold is high, so they have often suffered from dog hip pain well before we notice it. No matter how old your dog is or which breed, always pay close attention to his activity level as it can give you vital clues about his joint health. 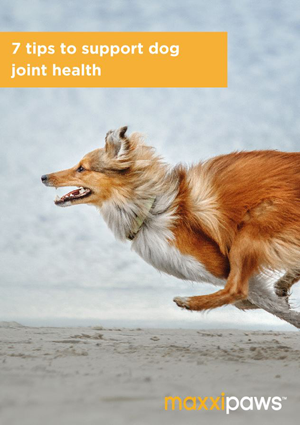 Detecting joint problems early on while the symptoms are still relatively mild, allows you to use less intrusive joint treatment options, like canine joint supplements. Good quality canine joint supplement supports the joints and can really help in those cases. Dogs with more advanced joint problems may have to go on prescribed medication, like non-steroidal anti-inflammatory medications (NSAIDS) corticosteroids, or pain-relieving medications whose actions are related to morphine. These medications do not treat the cause of the problem and have serious side effects, making them unsuitable as long-term dog joint treatment. In the most advanced cases, surgery may be needed, e.g. dog hip replacement or joint fusion. Surgery is not without a risk and can be costly if your dog is not adequately insured. The best way to deal with any disease is to try to prevent it before it occurs and there are number of ways you can try to prevent or delay dog joint pain and stiffness. Using good quality joint supplements for dogs, like maxxiflex+, is one of them. Other important prevention's include regular exercise and good nutrition. It is important to avoid excessive exercise as it may cause joint damage. Being overweight also causes extra strain on the joints so make sure your dog is within the recommended weight limit. No matter what preventive steps you take, some dogs will still develop dog joint problems in the future. Still, even dogs genetically predisposed of developing joint health problems (like dog arthritis) will benefit from your efforts of reducing the damage to their joint. Taking actions while your dog is young and healthy has long-term consequences. It will help your dog to stay active for longer and we all know that active dogs are happy dogs. Good dog joint care starts when your dog is a puppy. It is though never too late to start caring for your dog's joints. The best way to deal with any health issues is to try to prevent them before they occur. There are a number of ways you can try to prevent, or delay, joint pain and stiffness.